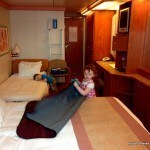 Having taken two cruises previously, I always imagined that a cruise would be an excellent family activity. When the chance arose for us to do a cruise back in the US, I jumped at it. Fortunately, I had only done minimal research when I booked it. I say fortunately, as when I did do further research after booking, it didn’t paint a pretty picture. In fact, it seemed to me that cruise lines were not interested in having very young passengers sail with them. Under 2’s are basically not catered for at all and yet are charged the same as an adult. I read a lot of accounts of people unhappy with the services available and worried about whether a cruise was right for their family situation. I would not have booked a cruise had I read these reports beforehand. However, I am glad I did as it turned out to be awesome! My account is specific to doing a Caribbean cruise with Carnival cruise lines. From what I read, the rules do not vary much between cruise lines and locations. If you are doing a cruise with a different cruise line, probably you will have some of the same experiences. Regardless, this should at least give you some questions to ask and some food for thought before booking with a particular cruise line. I am also being quite picky here, as I can see many areas they could improve and I want to set the right expectations for anyone else considering a cruise. I think with the right expectations and attitudes (and not just the general “it’s got to be great for a family” mentality I had to start with), a cruise is an excellent family holiday. I definitely worried for nothing. This is one of the things that bothered me when I did research beforehand. I already knew that Z wouldn’t be cared for, but I thought he would be allowed to go and play if we went with him, so him and S could play together. Unfortunately not. Online I read how under twos are only allowed to play in the play room 8-10am on sea days and older kids (in other words S) are not allowed to accompany them. S would only be allowed to go alone at specific times. Thankfully, this did not all turn out to be true. When we went to orientation on our first night, they backed this up as being correct, but the next morning when I took Z, others had their older siblings with them and I asked the staff and they said it was fine. We took them both in future for the sea day 8-10am session without a problem. There are also times when it was not run as a child care service and families could go all together. We loved this time and took advantage of it. If only there was some time like this every day! Unfortunately, this was not advertised on the daily ship schedule or on the under 2’s information sheet so if you are just travelling with an infant, I recommend that you also pick up a copy of the 2-5 year old program and look for these times. One of my craziest discoveries was when I learned more about evening care. I had read how all kids could go to the kids’ club in the evenings so the parents could have some time together. I couldn’t believe it when I found out that this is only between 10pm – 3am (some nights were only 12am – 3am!). I think it is ridiculous that they advertise this evening service without the full facts, as I am sure I am not the only one with small kids who would have absolutely no energy for that, even if I wanted to leave the kids at that time. I am well and truly in bed by 10! Thankfully, it didn’t turn out to be any problem taking the kids to the fancy main dining room with us, although a dinner or two alone would have been nice. From what I could tell, they are also quite rigid with the age groupings. So if your kids are say, 5 and 6 for example, they will be in different groups and can’t be together. They often did seem to combine the groups though. I will definitely be looking for cruise lines in future where my kids are able to be grouped together. On the upside, our daughter looooooved the kids club. I had been warming her to the idea for months, but she always said she didn’t want to go unless I went too. It took a fair bit of convincing to get her to go the first time. A few days later, she was waking up in the morning asking to go, so for the last few days she spent a few hours a day in there which was awesome for all of us. We got to spend some island time whinge free at adult pace (with Z in the carrier), and she was happier playing with other kids and doing the countless cool activities they do. She would come back every time with paintings, pictures, treats, certificates, books, stickers, etc, They would often give these things to Z too when we picked her up. It is a very well run service and I was very impressed. Z was, of course, still with us, and I look forward to cruising again in future when he can join her more regularly. They did offer under 2 paid sessions for a few hours in each port. On the last stop, in the Bahamas, we took them up on this. It was $6.75 + 15% gratuity per hour. The under 2’s join the 2-5 year old age grouping and we had no qualms at all about leaving Z with S, and he was used to the playroom anyway after the morning sessions. They loved this session together and so did we! Such a shame this was the only time we could do this. 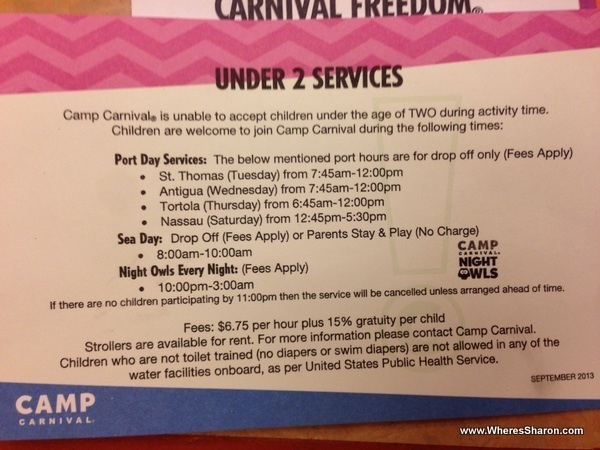 One of the things that made me regret booking our cruise was when I read that non toilet trained kids are not allowed in the pools. I find this rule quite ridiculous. Swim nappies are very effective and I have never heard of this rule elsewhere. Besides which, I am quite sure that all the drunk adults in the pools are having far more “accidents” than my kids ever will. They say it’s a US health regulation, but I have heard plenty of Americans complain about this rule as well, so I am not sure why it is this way. Thankfully, Z is big and looks older than his age. We took him in the pool and had no problems. We made sure it wasn’t at a time he was likely to poo, but the swim nappy would have held it anyway. Before we went on the cruise, we made sure we had bather shorts for him which would cover up the swim nappy. We saw other babies younger than him still going swimming. The only thing the stupid rule seemed to ensure was that they weren’t wearing swim nappies. I read someone else’s blog post about cruises before I left who wondered what the big deal was about cruise pools not allowing younger kids. It was supposedly written by a parent, but it must have been one who either didn’t have kids who wanted to do things together or didn’t have more than one kid. He wondered why a kid couldn’t go a week without a pool. Of course they can!! That was not our problem. Our problem is that S was quite aware that there were pools and wanted to go in them pretty much constantly. Meanwhile, what are we supposed to do with Z? He’s not going to be happy watching. He’s not happy without half his family, and we didn’t want to keep separating to do every activity. I am not sure what the point of a family holiday is if not to spend time together. What I didn’t think about and is quite a shame is that there isn’t a kids pool, except in the kids club. This pool is only allowed to be used by kids 6 and older who are in the kids club. A wading pool would have been great. All the other pools were too deep for our kids. They still loved being in the pools, but it is far more fun for all of us when there is a wadding pool. Some of the bigger cruise ships do have water areas made for toddlers (and usually in these areas non-toilet trained toddlers are allowed) and I would have booked one of these boats had I been aware of the rules before I booked. Something else that was annoying was that you can only use the water slide individually. S was just over the height restriction for it, but didn’t want to go alone. She was so disappointed when we got to the top only to be told that we couldn’t go together. I found it ridiculous they couldn’t make an exception as both of us combined still weighed less than most people on this cruise, and she is only three. One time when we were in a “whirlpool” (spa), I was also told by a staff member that kids weren’t allowed in there. I pointed the sign out to him right next to us that said they were allowed with adult supervision! He said nothing else. I actually went and complained about him as it annoyed me that he didn’t even apologise once he realised he was wrong. Something that surprised me was the lack of family activities on board our cruise. Cruises like advertising themselves for families, but the cruise we were on had lots of activities for different ages, but very few for all ages. Everything seemed to be targeted for an age, and often not open for all ages. The kids’ activities do not usually encourage adults either. 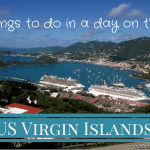 This makes a cruise a perfect family holiday if you want to spend all your time apart, but that is not why we travel and I found it disappointing. In saying that, with little kids it takes us quite awhile just to do things like eat, go for a walk and Z still needs a nap, so we were never bored or short of things to do. We took the attitude that our kids are welcome to do everything we want to do since we are paying the same as an adult for them. This was a great attitude and we learned a lot about what our kids enjoy that we hadn’t expected. For example, S loved the live singing and dancing shows and just live music in general. Her favourite time of the day was going to the lobby bar in the evening to dance to the live music. Before cruising, it would never have occurred to me that she would enjoy hanging out in a bar with music, but it may be something I seek out in future! She even happily sat through a comedy show with some help from the iPhone. 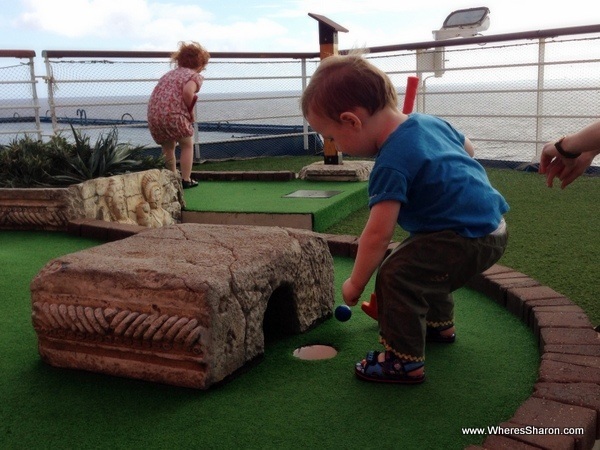 There was also mini golf which we all enjoyed. So, although the lack of specific family activities was disappointing, it really didn’t matter. Even three year olds can surprise you by enjoying the same activities as you if you give them a chance. Our outside cabin on the Carnival Freedom was surprisingly spacious. It had plenty of room for us and I was silly to waste a minute worrying about this. The twice daily cleaning service is also awesome for a family with young kids who can make quite a bit of mess! However, we weren’t always able to utilise this in the evening since Z would go to bed so early. I will write more about our cabin soon. This was one of the best parts about cruising with a family. There are sooooo many great eating options. With young kids who want to snack and eat constantly, it was great having food available all the time included in the price. Fruit was readily available too, so there are options outside the chips, burger and pizza that is available 24/7 for when your kids want to eat outside of meal times. We mostly ate in the main (fancy) dining room called Chic and Posh on this cruise which was fine with kids. They have high chairs and boosters, crayons and activity sheets. The staff were great with them and we ate there pretty much every chance we got. One evening we didn’t go and they even told us they missed us the next evening and soon knew us all by name, so we felt very welcome even though Z in particular was often whinging. We also made good use of the room service for breakfast. This was also a good opportunity to order some extra bits and pieces to keep in the cabin for food during the day or take onshore with us on shore days. Honestly, they just loved it. They loved all the eating out and great food, the kids’ club, the pool, live music, any activity we did, everything. S was often jumping up and down in excitement. They loved playing in our room. S loved going to the live shows. The whole thing was a hit. I am sure they would have loved it even more if they could have spent more time in the kids’ club together, but it didn’t really matter. Overall, some of the details are annoying and I do feel a bit discriminated against as a family with a young toddler. I think basically the cruise lines don’t want to encourage younger families (and I actually had this backed up when I coincidentally went to a market research session for P and O cruises back in Australia), BUT it really doesn’t matter. 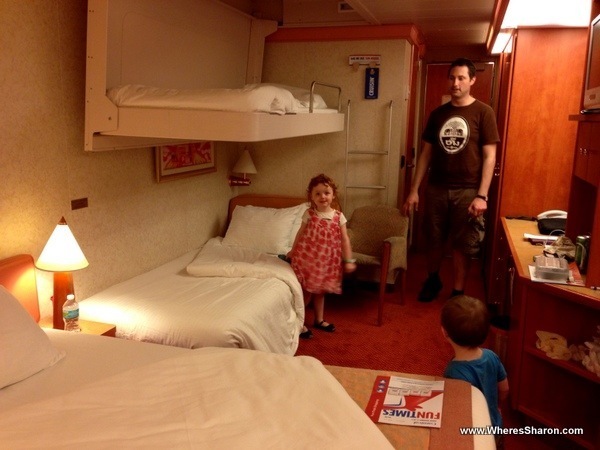 A cruise is perfectly set up for a young family mainly because it is so easy and there is little mucking around. For example, what could make things easier for a travelling family than free room service and 10+ restaurants within a few minutes walk of your room? And the room is cleaned twice a day! It beats having to find a rubbish bin outside your room to take smelly nappies. I can’t imagine a holiday that would be easier with kids, and it was the best break I have had since having kids. It was also nice to feel like we were able to be back in adult world while still spending time with our kids. It was honestly so much fun hanging out on deck on the sea days with party music, frozen cocktails, yummy indian food, ice , pools, spas – everything we each needed to have an awesome time together. My main advice would be to have a good attitude about it and remember that you are paying full price for your kids, so take them everywhere with you and do everything and don’t worry. So you can’t all go to kids club together. It’s annoying, but you can make your own fun and it really is just so easy to do that on a cruise. We will definitely do a cruise again. 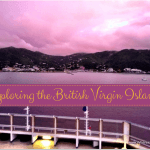 You can read more about our overall thoughts of this Caribbean cruise. 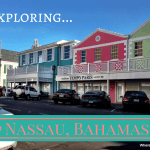 You can also read about our experiences exploring Antigua, the US Virgin Islands, the British Virgin Islands and the cruise port of Nassau, Bahamas. Find your own cruise now! Any questions? Any tips for cruising with kids? Disclaimer: This post contains an affiliate link which means that if you make a booking after clicking on it that we will receive a small commission. Thanks! We are thinking about doing a cruise later in the year and would have a four-year old and an 8-month old. I don’t imagine we would want any separation from the baby but that our four-year old would want to go to the kids’ club. It’s a bummer that little ones aren’t allowed in the pools. :/ That seems really dumb that they have to just sit and watch everyone else swim when they could be in with swim nappies. I wonder if the Disney cruises let babies in the pool? Can you think of any other issues there might be with taking a baby along? 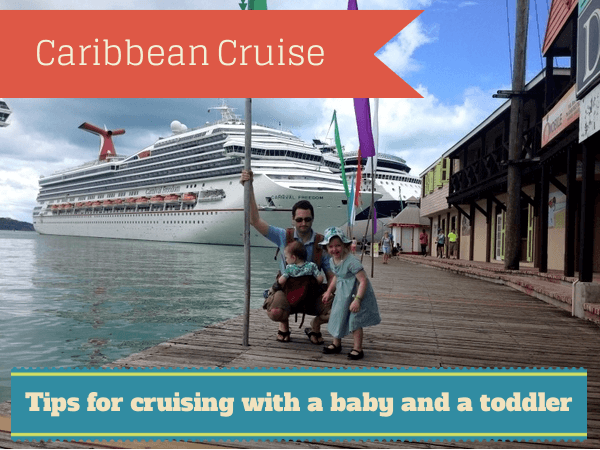 I got the impression that no cruise lines allow babies in the pools – please someone correct me if I’m wrong!! Quite a few ships have water play areas that younger kids can play on now, but I am not sure how great that would be for an 8 month old anyway. It’s a frustrating rule! I think an 8 month old will be great on a cruise. At least she will not have a tantrum if she sits by the pool while Reuben plays. I really don’t see any issues, although I didn’t try out their cots as we just found it easier to use the travel cot we had with us. We recently did a cruise with MSC on the Mediterranean and there were signs everywhere saying no babies or nappies in the pool but no one stopped us and our toddler swimming. He was in a Huggies swim nappy. I don’t think the rule is enforced in Europe anyway. That’s great that they didn’t care. 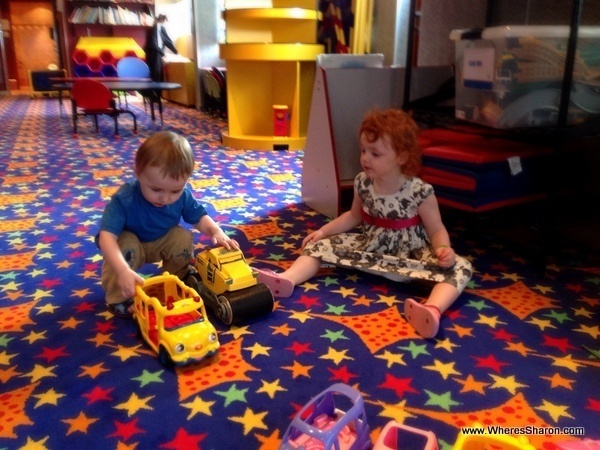 I think they would have enforeced it on this cruise – as it was I was told I wasn’t allowed to have Miss 3 in the spa with me when we went in once. This was despite the fact that it wasn’t listed anywhere that children couldn’t go in and there was even signs saying how children had to be accompanied by adults!! We didn’t get out, but I couldn’t be bothered dealing with it again. Based on a marketing study I did a few years ago, the reason why cruises prefer couples without kids is simple: Alcohol. Families with kids don’t buy as much alcohol as the other cruise passengers so they aren’t as profitable as couples without kids, groups of friends and family with grown-up kids. Interesting! I’m guessing families with very young kids are even less likely to buy alcohol so even less desirable!! In saying that, you would have to buy a lot of alcohol to make up for the cost of my son’s cruise ticket (considering he cost them basically nothing to be on board). I think the first time we took our sons on a cruise, the younger one was 8 and the older one was 12. They both flatly refused to have anything to do with the kids’ clubs, but that turned out to be fine. Once I convinced myself that it would be really difficult for one of them to go overboard, we let them roam. They found other children their ages to play with. We also found that cruises were a fantastic inter-generational family holiday (or vacation, as we say in the US). On one Alaska cruise, we ranged in age from 13 to 90 (our sons’ great grand-mother)! During the day, we would all go our separate ways for age-appropriate activities — i.e. a bus tour versus a hike or white water rafting, but at night we gathered around our table for 10 in the dining room and shared the stories of our days. 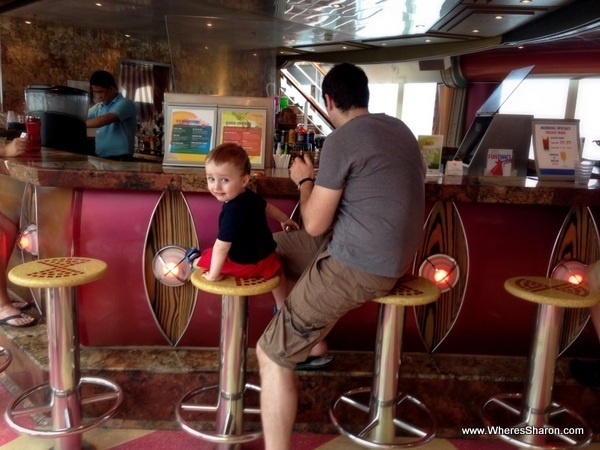 The only time we found ourselves annoyed by other peoples’ children was on a cruise that left from Cyprus. Most of the passengers were Cypriot and controlling their children is apparently not a cultural imperative. We had kids rolling around on the floor under our table, helping themselves to food off our table and running around screaming, in a bar, at midnight. Yes, I saw lots of inter-generational family trips. They looked great!! I was jealous whenever I saw that as I would so love my family to do something similar but unfortunately that is not likely to ever happen. They are just too expensive in Australia. I imagine there would be lots of freedom on a cruise with older kids, I look forward to trying it one day! My first cruise was an inter-generational family trip that included a 2yr old and 5yr old on Princess. Although everyone enjoyed the overall experience, I would agree with your assessment of cruising with toddlers. Fortunately, most of the staff were willing to bend the rules within reason. Suzanne, sounds like you got stuck with a bad group. Grew up around many Cypriot families and they were always super strict about having manners and being respectful. I love the post! I am bit of a cruise junkie and now that I have toddlers myself, I can’t wait to take them along for an adventure at sea. We’re actually taking a cruise this fall on Carnival, so we shall see how it goes. I didn’t realize there was so many funny rules about toddlers, but my kids love hanging in bars too! I learned this on our many trips to Las Vegas. Bars with live music is fun for the whole family! I know that Disney Cruises definitely cater to young families and all my friends had “magical” experiences. We’re giving the Disney cruise a try next year. We were able to order it to the room or get it from the dining rooms so normal milk was not a problem. We were unsure how easy soy milk would be to get (my son is dairy intolerant), so we took that on board with us in UHT cartons. Enjoy! 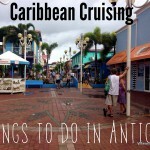 I have read tons of hints, tricks, and reviews about cruises from pinterest. And your blog is the best of all! We will be traveling with 7 and 3 year-old boys on Carnival Victory. I especially liked about your good attitudes of taking your kids everywhere. I can’t wait to take my kids to the bars with music. It would be so much fun. Hi Sharon, just came across your blog and love it. We are cruising RCCI over Christmas/new year to the Sth pacific with our 17 month old as well as grandparents and my brother and his family. I see in one of your replies your son has a dairy intolerance – my son has a severe dairy allergy as well as egg and wheat allergies. I’m naturally VERY anxious about him being around so much food etc. any tips or advice on managing allergies while travelling? Aside from obviously noting it on special requests and speaking with dining room staff. Hi Cat! I can definitely understand why you are anxious, what a terrible thing to have to deal with. My son’s intolerance is not extreme and thankfully a bit here and there is ok. I am not sure what you can do other than what you mention. I would hope that they would take it seriously and that would do. If I was in your situation, I would probably ring the cruiseline before going as well to talk about it and hopefully put your mind at ease. Cruising is great!! so I hope it’s a very positive experience for you. Please let me know it goes in general as I would love to do a south pacific cruise!! I really love cruising with the kids. I used to cruise carnival all the time and have always had a great time. We did just take the kids on a Disney Cruise to the Caribbean and that was awesome, talk about a kicking kids club. I so want to try a Disney cruise. They sound unbelievable!